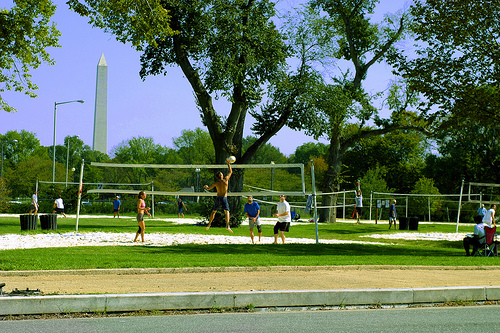 Washington, D.C. has been named the "fittest" city in America. Photo by bigmikesndtech. The Delhi cabinet decided to raise road tax rates, particularly for high-end motorcycles and luxury cars, to discourage private vehicle use and generate additional revenue for the city government. Meanwhile, the Delhi transport department plans to impose a fee to motorists driving in congestion areas to help alleviate traffic, a major concern leading up to the Commonwealth Games. “You can entice even diehard rail riders onto a bus, if you call it a ‘special’ bus and just paint it a different color than the rest of the fleet,” said U.S. Federal Transit Administration Administrator Peter Rogoff in a May 18 speech he delivered to the nation’s top public transit officials in Boston, Mass. It’s still National Bike Month and you could win a brand new bike. Sign the pledge at peopleforbikes.org and write a haiku in praise of your bike at the Sierra Club. The American College of Sports Medicine released its annual list of the United States’ fittest cities. The top five are: 1) Washington, D.C.; 2) Boston; 3) Minneapolis; 4) Seattle and 5) Portland, Oregon. Daily bike riders are growing in numbers across the United States. Seattle Times reporter Katherine Long chronicles the development and direction of the expanding bike culture in this Pacific northwest city. Malaysian-born Hollywood star Michelle Yeoh traveled to the Philippines this week to attend a three-day transport forum, hosted by the Asian Development Bank (ADB), to promote road safety. Yeoh is the Global Ambassador for the Make Roads Safe campaign. Heavy air pollution in urban areas may not only contribute to higher blood pressure levels, as reported in the “Environment” section of last week’s TheCityFix Picks, but it may also increase the risk of developing diabetes. According to a report in the health journal Environmental Health Perspectives, exposure to air pollution increased women’s chances of developing type 2 diabetes. President Barack Obama called for the first-ever national policy to set mileage and pollution limits for big trucks and buses, which contribute to 21% of transport-related greenhouse gas emissions. An emergence in “new urbanism” is creating healthy, livable cities – from Bogotá to Abu Dhabi – through sustainable transit, bicycle paths, pedestrian streets, and green spaces. Noah Kazis, a former full-time blogger for TheCityFix DC, writes about what happens to old bus stops when they’re no longer in use. Some ideas from San Francisco: Transform them into bike parking. Or what about a “parklet”? The Gov 2.0 Expo brought together technologists, government officials, IT professionals and other Web 2.0 experts in Washington, D.C. to discuss digital collaboration and communication in the government sector – especially useful for cities. Nissan Motor Co.’s Chief Executive Officer Carlos Ghosn defended his plan to sell 500,000 electric cars per year by 2012, despite skepticism from critics who say his plan is unrealistic.